The Canon EOS 7D targets professional and semi-pros alike who shoots in the APS-C size format. The Canon 7D comes with a 18 megapixels APS-C CMOS sensor, Dual DIGIC 4 processors and ISO sensitivity up to 12800. The 7D also delivers high performance AF and metering systems with a 19-point cross-type AF sensor and an iFCL metering system with 63-zone dual-layer sensor. Enabled by the Dual "DIGIC 4" processors and improved electrical system, photographers can capture images at 8fps, without the need for additional accessories and in all file types. The EOS 7D enables photographers to capture subjects in their natural light. The ISO range (100 - 6,400) is expandable to 12,800. With improved operation, making it easy to switch directly to movie mode, it is now even simpler to shoot Full HD video. Users can set exposure and frame rate - with options for 24 fps to create that cinematic feel. By utilising Dual "DIGIC 4" processors, users of the EOS 7D never have to compromise between shooting speed, image quality and ISO performance. 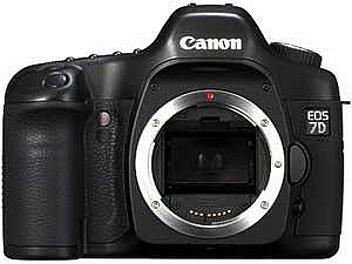 Canon has listened to photographer feedback when designing the body, as well as the internal technologies. A magnesium alloy body offers environmental protection - the tough, lightweight construction is designed to defend against moisture, and dust - equivalent to the legendary EOS-1N.